Nathan has pursued a dream of owning his own dressage horse and now after years of saving, Nathan has finally bought one. His Trakehner mare, Tsarina, is young but Nathan hopes to show her after they spend some time training together. But all Nathan’s hopes and work of 15 years is shattered in one moment. On Nathan and Tsarina’s first trail ride, a motorcyclist on the wrong trail causes a horrendous fall that breaks several of Nathan’s bones and sees him on his way to the hospital and Tsarina loose in the woods, his summer and hopes in ruins. 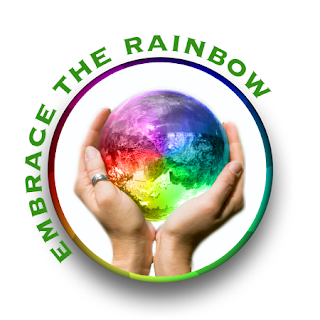 Ryan has always traveled where his wanderlust takes him with nary a thought of settling down in one place. His current travels have brought him to Tucker Springs, Colorado on his way to Texas and a job for the winter. But one wrong trail ride on his motorcycle changes his path after he causes a rider to fall after his horse shies when Ryan veers into their path. The rider, Nathan, has a broken leg, and a broken hand that resulted from a mean right hook after Nathan punched Ryan in his fury and pain. Feeling guilty, Ryan offers to look after Tsarina while Nathan is incapacitated. Before each man realizes it they have fallen into an easy friendship that soon turns into something more. But each man has his own insecurities and issues to deal with that starts to throw up obstacles to love. Can Ryan and Nathan put aside the past in order to make a future together? After The Fall, Tucker Springs story#6, brings back a character, Nathan, that we first met in the very first Tucker Spring novel, Where Nerves End. In that story, we come across Nathan as Michael’s young assistant in his shop Tucker Springs Acupuncture. He is introduced as a young, college age, nattily dressed gay man but we lacked a larger picture as to who Nathan was. Now L.A. Witt fills in the portrait she started a while ago and we get to see his depth of character and his dreams for himself. I found it startling that Nathan aspired to own a warmblood and show in dressage, a lovely quirk for a western town where the style of riding is so different. That is an unexpected and marvelous side of Nathan. And by its inclusion, the author gives Nathan a layer that lets us know that he is a serious, disciplined and caring young man all at once. Owning his own horse is a goal Nathan has spent “ten years of dreaming, three years of saving, and almost a full year of searching for the perfect horse”, so his happiness and anticipation on the first day he is going to get to ride his horse is palpable. And it makes what happens next scary and heartbreaking in vivid and authentic detail. But the author has also given Nathan more than his share of past problems with men and those issues as well as watching his friends in the act of demolishing their own relationship has caused Nathan to pull away from any romantic relationships of his own at the moment. As Nathan reasons it out for himself, he has a full life and schedule and a romance would only add its unwanted complications at the moment. I think we have all been there at one time or another and this makes Nathan a character we can certainly relate to. The character of Ryan (no last name) is more of an enigma. We learn little of his past, some about his family and a smidgen about what prompted his tumbleweed lifestyle. But frankly his personality is overshadowed by that of Nathan, who is telling the story. That lack of fullness to his character leaves the resulting romance between the men lacking as well. True, there is a sweetness to the manner in which they fall in love, a startling contrast to the way in which they first met. I certainly enjoyed watching them become first friends and then lovers but it could have felt so much more real had Ryan been more fleshed out as a person and Nathan’s equal. There were a few other quibbles for me in this story. One, for Ryan to learn how to push a dressage horse into a collected trot or canter using his seat with no training is a tad unrealistic, considering the amount of skill and training that goes into a dressage horse and it’s equestrian partner as well. Yes, there are natural riders out there who just seem to “get it”. They have a great leg and a natural seat that just sticks to the saddle, flowing along with the rhythm of their partner. But Ryan doesn’t even know how to hold the reins in an English style, having learned the western method of riding which is completely different. Beginners usually saw on the reins or pull too hard, The subtle tickling of a braided rein, the slight tension required takes time, more time than Ryan had. My other quibble is the lack of last names. I don’t know why but this drives me crazy. If you want us to believe in characters fully give them a complete name. Unless they are Cher of course. Stepping off my quibble box now. For most readers the last two issues won’t be a problem with them. It’s just nitpicking on my part. But Ryan’s character and the swift resolution of their commitment issues might be more problematic. I think another chapter or two would have seen the ending more drawn out and given the author more time to paint a more realized picture of a man who finally finds a place and person to call home. 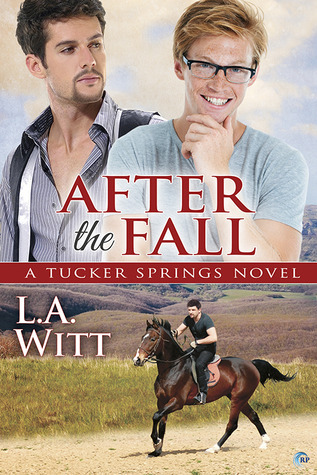 I really enjoyed After The Fall and I think you will too, especially if you are already a fan of the Tucker Springs series. Cover Art by L.C. Chase, lcchase.com/design.htm. Love the cover but ack…that posture, those flying elbows…tuck those babies in. Shakes head. 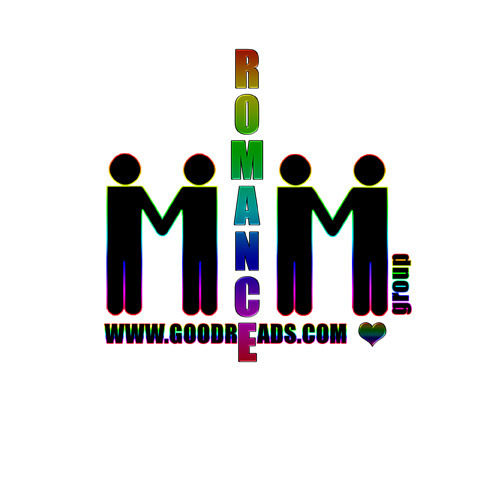 This entry was posted in Book Reviews, Books, Contemporary fiction, eBooks, LGBTQ Book Reviews, M/M Contemporary Fiction, M/M Fiction, M/M Romance, Riptide Publishing, Uncategorized and tagged friends to lovers, gay college student, gay dressage riders, gay virgin main character, L.A. Witt, LGBTQ fiction, m/m comtemporary romance, recommended, Tucker Springs novel, Tucker Springs series, warmblood horse, Where Nerves End.